Here’s some information about how Arizona compares to other states in terms of taxes. The only things said to be certain in life are death and taxes. Yet some high-profile people like Wesley Snipes and Lauryn Hill think that taxes are unjust and unfair. You work hard for your money, and you should decide where it goes, the thinking goes. Yet even those who believe in the necessity of taxes (even if they don’t like seeing a chunk of their pay taken) still disagree about how fair the current system is. Some believe that the tax percentage that is levied is unfair, while others believe that certain taxes, such as property taxes on automobiles or sales taxes, are unfair. A recent study from WalletHub.com found that Arizona has one of the least fair tax systems, according to responses that citizens gave to a survey about the state’s tax system and what they feel the tax system should be like. Arizona ranked 41 on the fairness index, right between Ohio and Indiana. The rankings were based on the fairness of each state’s property tax, income tax, and sales and excise taxes. Arizona ranked low on the list based on its dependency on sales and excise taxes, which are considered unfair to poor and middle-class families. The report found that Arizona was the seventh worse for taxing the poor. Those in the lowest 20 percent of income brackets paid about 12.5 percent of their income in taxes. Meanwhile, those earning the top 1 percent of income paid only 4.6 percent of their income in taxes. The study noted that most people favor a progressive tax system that taxes the wealthiest earners more than the poorest. This opinion was pervasive among both liberals and conservatives and in both red and blue states. Others believe in a proportional tax system that charges the same percentage of income, regardless of how much is earned. Yet Arizona has neither a proportional or a progressive tax system. Those in the survey who believed that it was more fair to impose higher taxes on the wealthy suggested that those earning less than $5,000 a year should have a tax rate of 2.5 percent while those earning $2.5 million or more per year should have a tax rate of 16.4 percent. Montana was the state considered to have the fairest tax system, followed by Oregon, South Carolina, Delaware, Idaho, Minnesota Utah, Virginia, Colorado, and Maryland. Washington was the state considered to have the least fair tax system. The state overtaxes the poor more than anywhere else in the country. While you can’t make immediate change where your state’s tax system is concerned, you can fight IRS findings against you that you consider unfair. 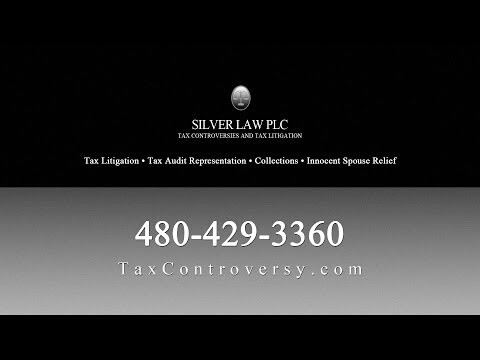 Working with an experienced Phoenix tax lawyer from Silver Law PLC can help you fight an audit, combat collections efforts, file for innocent spouse relief and more. Our firm has been providing IRS tax help for residents throughout Arizona for many years. A tax lawyer from our firm can help you understand your legal rights and the options for fighting the IRS. Call us today to get IRS tax help and reduce the fines and penalties against you.